The world’s investment community, including besieged private investors, is reeling at the twin terrors of sovereign financial breakdowns on both sides of the Atlantic. Gold has responded by rising nearly $150 in less than a month under heavy global demand. No sooner does the dust settle in Europe than something is kicked up in the United States, or vice versa, complicating the decision-making process and narrowing the options. We thought it would be interesting to catalogue in one place the best quotes on gold going over $1600 — the thought-provoking, the witty, the profound (not necessarily in order of preference). As this is going to be the last of these Updates, it is appropriate to review the reasons for writing this series of articles on Elliott Wave and the gold price. This will involve revealing a lot of personal detail and also unveiling an extremely high forecast for future gold prices. The first article titled “Elliott Wave and the Gold Price” was published on 25 August, 2003. In August 2003 the gold price was in the region of $350 and there were a number of conflicting views about the future direction of the gold price. Robert Prechter, for example, was predicting a move to below $253 and possibly below $200. For a number of reasons I was of the opinion that gold was in the very early stages of a major bull market. My views were thus the opposite of Prechter’s and I eventually plucked up the courage to say so. I thought that the $630 forecast was conservative and that this number would probably have to be adjusted upwards later once the minor waves unfolded. 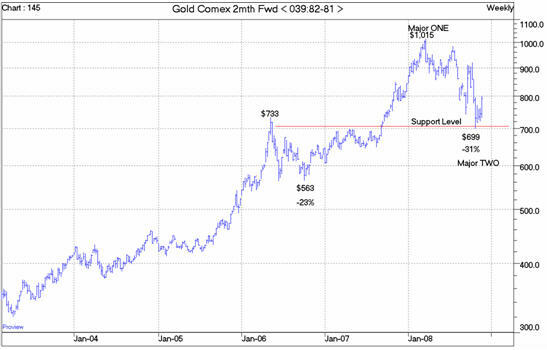 In 2003, with gold in the mid $300′s, a forecast of $630 was both courageous and extremely daring. There was no purpose served in taking the exercise beyond that point until after the $630 target had been achieved. As mentioned in this quotation, I prefer to have fundamental and technical analyses in line with the EWP before committing to a position. Obviously I was satisfied with the fundamental and technical outlook for gold when I made the dramatic change in our investment portfolio in 2002. # 1. The 21 year bear market in precious metals had ended with the multi-decade down trend line being broken on the upside. # 2. The precious metal markets were oversold with sentiment and emotional indicators sporting extreme negative readings with bullish connotations. # 3. In the 1970′s bull market, gold increased from a low of $35 to a peak of $850, a massive 24.3 times the low price. If the current bull market was to be of the same order, then one could project an ultimate peak of over $6,221 ($256 x 24.3). This matched the $6,000 target determined under the EWP. This article reprinted at USAGOLD by kind permission of the author, Alf Field. Michael Kosares has over 30 years experience in the gold business, and is the author of The ABCs of Gold Investing: How to Protect and Build Your Wealth with Gold, and numerous magazine and internet articles and essays. He is frequently interviewed in the financial press and is well-known for his on-going commentary on the gold market and its economic, political and financial underpinnings. I’m the Finance editor at Before It’s News. Our site is a People Powered news platform with over 4,000,000 visits a month and growing fast. We would be honored if we could republish the rss feed of BuyGoldSilver.org in our Precious Metals category. Our readers need to read what experts like you have to say. Next post: Are Gold & Silver Going Higher Again in 2011?